I have just passed my one year post op and I am having mixed feelings about it. I will be meeting with my dietitian, nurse and surgeon this coming Friday and I will likely be discharged from the program which makes me very nervous. Once discharged I will no longer have the support from my medical team which I honestly don’t hardly ever use but it makes me feel secure to know that should I have questions or need support they are there for me. I have officially reached my goal this morning of 150 lbs and I find myself unsatisfied, maybe another 5 lbs? I tell myself I have come a long way and that I am happy with my weight but the truth is I am really struggling with what I see in the mirror most days. My goal now needs to be to increase muscle mass and decrease body fat % with less focus on the number on the scale, this is a head game I have with myself that is going to take a lot of work to get past. I have a referral sent to Dr. Mitchell to have my excess skin around my belly removed and maybe once that is done I will finally be happy with myself. I am looking at probably another year before I will get a surgery date for skin removal which I am actually thankful for. I want some time to build more muscle and make sure I am maintaining a good weight before I get the skin removed, also I am terrified. I am terrified of the level of pain from this surgery, the long recovery time and the staples that will have to be removed. Unfortunately it is not an option to not get the surgery as I have already encountered a couple of infections in and around my belly button from the excess skin. Don’t forget to check out my progress page and the before and after pics!!! The last few weeks have been very stressful and I hate to admit that I missed one of my home training sessions and my food choices have not been great. It is hard to know that I can easily eat too many calories in a day and it is a slippery slope to weight gain. Sometimes I wish I was one the people who couldn’t eat things like chocolate because it made me sick but sadly I can eat whatever I want. So we had a family problem that turned into 3 days of tears and 2 weeks of stress and maybe even a slight bit of depression. Day 1 I had a session booked with my personal trainer so even though my first thought was to hit a McDonald’s and drown myself in something fattening and greasy I didn’t, I went to my session and had something reasonable to eat at home after. The rest of the first week was actually not to bad, I wasn’t making great choices but I wasn’t really making terrible choices either. Week 2 was awful and Halloween didn’t help the situation. 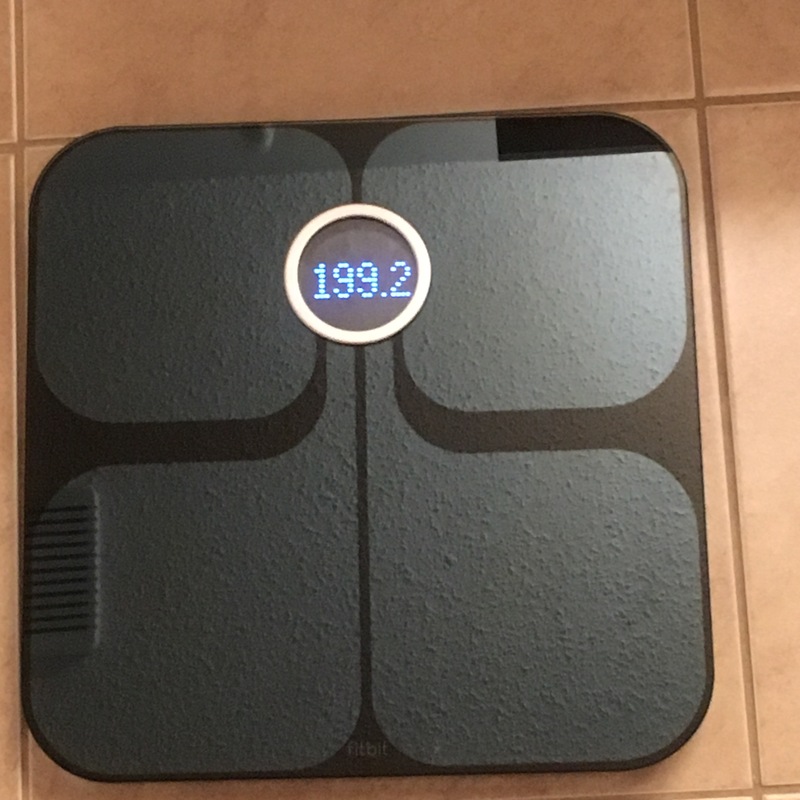 I was eating everything I could get my hands on without tracking calories until the end of the day at which time as I logged all of my bad choices I would realize that I had eaten more than 1200 calories. I have eaten tons of chocolate, chips, eaten out and drank alcohol more than I have since my surgery in February. Today when I stepped on the scale I was up, only 0.4 lbs but still I was up and it made me really realize how much I had been sabotaging myself. Today I have hidden the Halloween candy away in a cupboard so that it’s not staring at me every time I enter the kitchen and I have packed a healthy lunch and snacks for work. Today I WILL stop self sabotaging!!! Today I get back to following my plan and eating the foods that I know are good for me. I am so close to goal and I am hoping to reach that goal by Christmas, I seem to always have a “Christmas Goal” but this year I could actually reach it. For the first time in 2 weeks I am feeling hopeful again. So last week my weight didn’t change which for me is a first since surgery. Many people have plateau’s after weight loss surgery, some happen early, some happen often and some happen for long periods of time. So have I hit a plateau? Is my body just needing a chance to catch up? Is this just my body slowing down? Am I replacing my fat with muscle? I don’t know the answer to this yet. I have started working out with a personal trainer once a week. Since I am only seeing her once a week she gives me fitness homework. Right now I am doing strength training once a week with the trainer and once a week at home, I am also doing cardio training twice a week at home. Since the first week I started with her was the same week I didn’t lose any weight I am going to be positive and believe I am building muscle. My trainer has done before pictures and has taken my weight and measurements, my weight and measurements will be done by her again at the 1 month mark at which time I am hoping to start seeing some changes in my body even if they are small. I have decided that I no longer just want to be thin and be able to buy regular clothing, that is not good enough. I want to be strong, fit & healthy no matter what weight I end up at. I have already noticed after only 2 weeks that I feel stronger and have more energy so I can’t wait to see the results after 3 months. At more than 5 months post op I am feeling great. I have had results that have exceeded my expectations and I am looking forward to getting to my goal weight which doesn’t seem so far anymore. I actually feel like I will make it to goal, it used to feel like it was impossible. I want to share a few things that have happened in the last few weeks that were either unexpected or just things that would have never happened without the gastric sleeve surgery. I lost weight while on vacation camping for 2 weeks, I have never lost weight on any vacation ever! I have tried on clothing that I thought was going to be too small and it fit. I can actually shop in a regular clothing store it doesn’t have to be a “plus size” store anymore. Strange but true, some of my shoes have gotten too big. This is bitter sweet as I have some shoes that I absolutely love and I may have to give some away. I realized today for some reason that I get to buy a new winter coat this year and I will be able to buy something that is nice because I will have options other than the 2 or 3 boring coats the plus size stores always stock. I am enjoying getting dressed in the morning even when I have to put a favorite top in the “too big” pile. I am not loving my body but I don’t hate it as much as I used to. Excess skin, this is something I am just starting notice and I find myself thinking more about skin removal which is something I had hoped to avoid. Hair loss, my hair is still falling out but I think it is falling out less than it was a few weeks ago so I am hoping that in the next month it will have stopped coming out. Soon I will be at 6 months and I think it is expected that the weight loss will start to slow down a little. I have another 30 – 40 lbs I would like to lose, I think 30 is probably more realistic and I am hoping to get to my goal before 1 year surgery anniversary. I think in order to reach my goal I really need to step up my activity. Being more active is always a goal and I am not sure what holds me back from getting a regular exercise schedule going but if I want success I need to figure out how to fit it in even when we are crazy busy. This list could go on but I think you get the picture. Yesterday I was having a great day and then I went into the store to get a protein drink for at my sons lacrosse game and I came out with a box of smarties. I didn’t want the smarties before I bought them I didn’t even really want them while I ate them but I ate them, all of them. I felt like I failed my surgery, it’s funny that I never thought my surgery failed me. Sometimes in these moments I wish I was like so many other sleeve patients who eat chocolate and get violently ill for a couple hours. Being sick would surely teach me not to eat a box of smarties right? Fast forward to today and it was weigh in day, down 2.5 lbs this week!!! Maybe it was the good nights sleep or maybe it was the weight loss, whatever the reason my attitude was better this morning. I thought so what it was one day, you will do better today. You are NOT a failure! I got to work this morning and I walked right past the 2 bite brownies a client brought yesterday (I ate one of those yesterday to) and went to my office without giving them a second thought. I am grateful for this surgery and to know that even if I have a bad day I can get back on track and it doesn’t have to ruin my week. I do really need to work on letting food and my weight decide if I am going to be happy or depressed.